Home Technology Amazing Smart Watch. Researchers at Future Interfaces Groupat Carnegie Mellon University came up with a new technology that turns skin into a touch sensor. 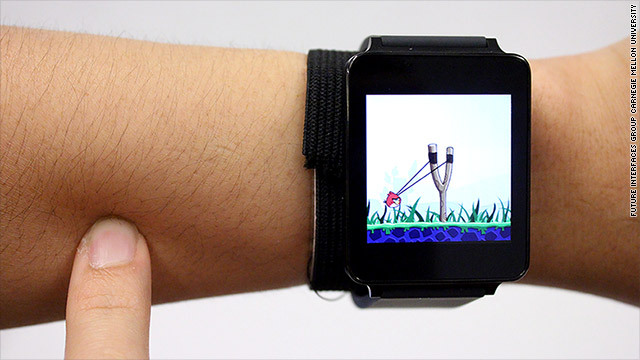 “Small wearable devices — such as smartwatches and digital jewelry — are fast becoming viable computing platforms … however, their small size severely limits the user experience,” the researchers wrote. When the finger touches the skin, it sends a high-frequency electrical signal into the user’s arm. The device uses the human body as an electrical conduit. That might sound a bit scary, but it is safe and already used in other areas, including medical tech. Skintrack recognizes all the usual touchscreen signals, including tapping, swiping, and spacial gestures. In the demo video, the researchers show how drawing “N” on a wrist launches a news app, while “S” puts an incoming call on silence.